I get the sense that everyone knows Babes. 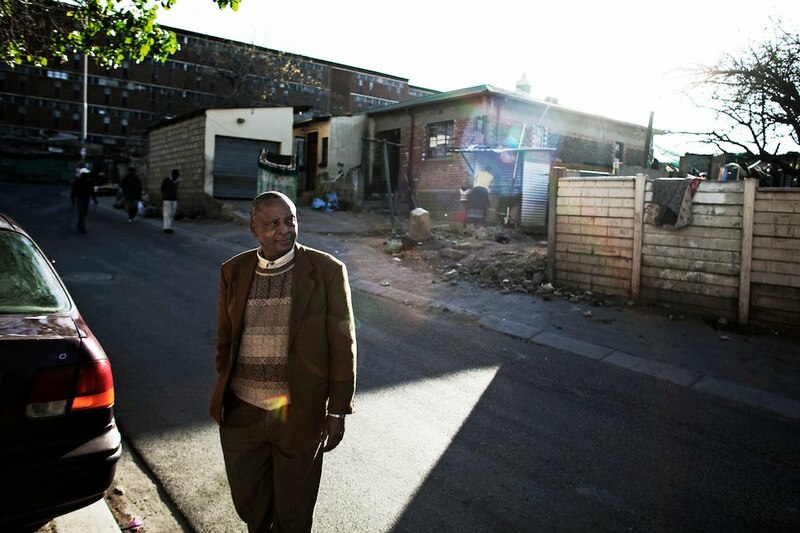 Sixty-nine years old, born in Alexandra township in Johannesburg, South Africa, Babes lives there to this day. A cross between James Earl Jones and Morgan Freeman, his deep raspy voice full of vibrato and passion seems equally fit for the big screen and inspires both attention and obedience. Babes it is. His crimson Honda Ballade putters outside the gate to his sister’s house with whom we’re staying and we ease in. June is winter in South Africa and it’s cold. Babes is wrapped from head to toe in multiple layers of thick wool. Well worn fleece gloves insulate his fingers from the ice cold steering wheel and a cotton hat is pulled over his balding head at a slight angle. As we enter Alexandra (Alex), the streets increasingly swell with people moving around our car like water around rocks in a river. Intimately familiar with his environment, Babes makes his way easily. Most of the streets were paved recently––one of many development efforts aimed at improving the desolate conditions in the township. But every year, particularly after immigration laws were relaxed, more and more foreigners from neighboring countries pack themselves into Alex. One room shacks, their corrugated metal roofs held down with stones, fill a majority of the township. Population density is intense. 1.5 million people, Babes says, somehow eek out life together within four square kilometers. Yet there is an unmistakable sense of vibrancy and life in Alex. Out of the car now, Babes maintains a running near-monologue interrupted every other minute by quick visits with friends he bumps into. School is out of session and kids fill the streets. They are rarely without a soccer ball. “Football in Alex was and is a way of life.” His emphasis makes life sound impossible without it. The shocks squeak their complaints as we get back into the car which sags noticeably under our weight. Babes carefully maneuvers back down off the sidewalk where all cars park in Alex. Vendors also crowd the sidewalks, selling street food and hawking flags, jerseys and vuvuzelas (plastic horns). World Cup fervor is everywhere in South Africa. Who speaks like this?! This is a man, I realize, who speaks the written word. Babes is silent. I imagine him lost in thoughts of the past and wonder what he’s thinking but am sure he will soon share it. Instead he astounds me, now as ever, with his gracious, unwavering dedication to us and our film. This entry was posted on Wednesday, June 23rd, 2010 at 10:57 pm. It is filed under Babes, Characters and tagged with babes, jacob bopape. You can follow any responses to this entry through the RSS 2.0 feed.